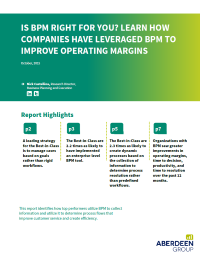 This report identifies how top performing enterprises are utilizing BPM to collect information and determine process flows for improved customer service and efficiency. In the age of the consumer, every organization should be concerned with satisfying the customer—and in order to be efficient in doing so, companies must take a new approach to designing, implementing, executing, monitoring, measuring and updating processes. In order to provide these capabilities, organizations should consider business process management (BPM) solutions. The days of rigid constraints and traditional best practices should be traded for a more fluid system that improves customer service and reduces operational costs. Companies should take action as soon as they receive information without being constrained by outdated protocols. Organizations that implement BPM solutions are twice as likely to achieve their visualized outcomes and the management solution will also track process flows in real-time.